Weight regain following gastric bypass has been associated with enlargement of the gastric pouch and with dilation of the gastro-jejunal anastomotic stoma. We developed a new technique for revision of the pouch and stoma using a novel endolumenal suturing device in an ex vivo model porcine stomach model. The novel prototype device is a flexible Endo Stitch™ (Covidien Surgical Devices) suitable for endolumenal or NOTES applications. Barbed sutures are used to obviate the need for knot-tying. Methods: We created an 8x8x10cm gastric pouch from porcine gastric explants, then an anastomosis using a 31mm circular stapler. We measured the volume of the pouch at 30mm H20 pressure and then measured the stoma diameter using a graduated cone. Under endoscopic guidance, we first plicated the anastomosis with a goal of reducing the diameter to between 15-18mm. We then plicated the gastric pouch using a running suture along the lateral aspect of the pouch, with a goal of reducing the pouch size by at least 1/3. Following plication we re-measured the pouch volume and stoma diameter in the same manner. In order to assess the holding strength of the knot-less plications made with the novel knotless suture we then tested each pouch under a manometer to assess the leak pressure. 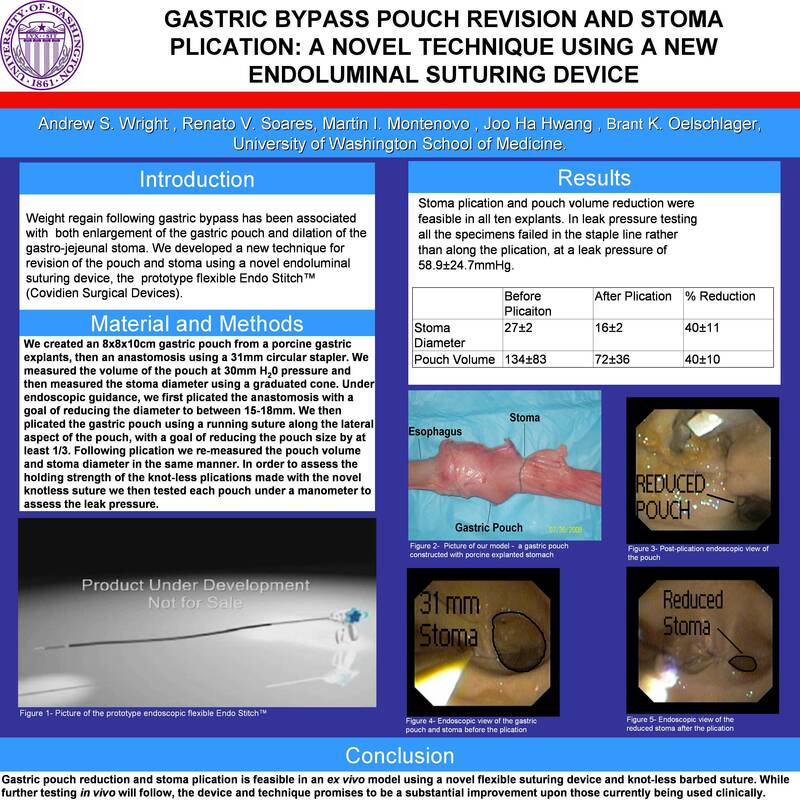 Results: Stoma plication and pouch volume reduction was feasible in all ten explants. In leak pressure testing all specimens failed at the staple line rather than along the plication, at a mean leak pressure of 58.9±24.7 mmHg. Conclusions: Gastric pouch reduction and stoma plication is feasible and straight forward in an ex vivo model using a novel flexible suturing device and knot-less suture. While further testing in vivo will follow, the device and technique promises to be a substantial improvement upon those currently being used clinically. Device under development. Not for sale.